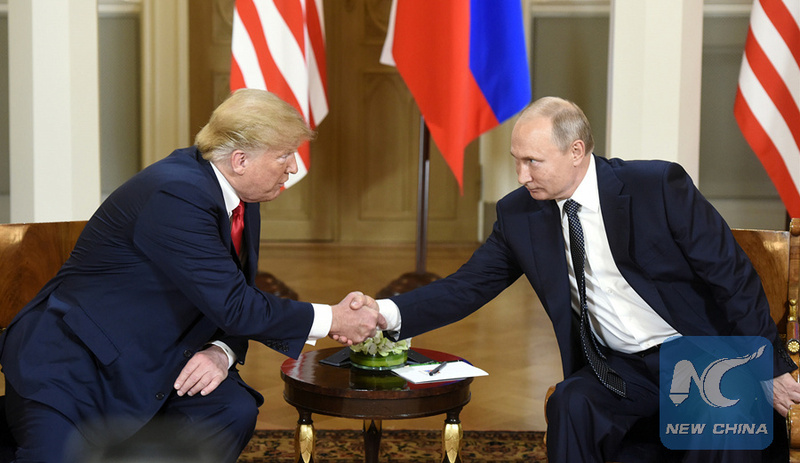 MOSCOW, Aug. 11 (Xinhua) -- Russia-U.S. confrontation is extending to the economic and trade field as Washington is poised to slap new and powerful sanctions in a move Moscow views as the declaration of an "economic war." The U.S. State Department said Wednesday that Washington will impose new sanctions on Russia on or around Aug. 22 over the alleged poison attack on ex-Russian spy Sergei Skripal and his daughter Yulia in the British city of Salisbury in March. According to the Russian Foreign Ministry, the U.S. restrictions will possibly include a ban on foreign assistance to Russia and sale of military and dual-use items to the country, as well as renunciation of providing state loans and other financial aid. U.S. State Department officials estimated that the sanctions may affect hundreds of millions of dollars worth of exports, dealing a blow to some 70 percent of the Russian economy which may result in an approximately 40-percent fall in workforce. "All I can say is: if they ban banking operations or the use of any currency we will call it the declaration of an economic war," Russian Prime Minister Dmitry Medvedev said Friday. "And we'll have to respond to it - economically, politically or in any other way, if need be. Our American friends should make no mistake about it," he warned. News about the upcoming U.S. sanctions has thrown Russian ruble to a record low since 2016. The currency traded 67.72 per U.S. dollar on the spot market at the Moscow Exchange Friday. Russian stocks also tumbled on Friday, with the ruble-denominated MOEX Russia Index falling 1.5 percent and the U.S. dollar-denominated RTS Index dropping 3.68 percent. Russian Finance Minister Anton Siluanov attributed the ruble depreciation partly to the new U.S. sanctions. But he added that the unstable situation on developing markets are also to blame. Despite the volatility, Kremlin spokesman Dmitry Peskov said Russia's financial system is "fairly stable" and it has proved its resilience in difficult times. Russia's broader economy is recovering from years of recession. The Russian federal service for state statistics said Friday that the country's GDP grew 1.8 percent in the second quarter of the year, up from 1.3 percent in the first three months. Russia's trade surplus surged 78 percent year on year in June to reach 15.5 billion dollars, the Russian Central Bank said Friday. On Aug. 5, Russia started imposing additional import tariffs of 25-40 percent for a range of U.S. goods, including road construction, oil and gas industry, metal processing machinery as well as fiber-optics. The volume of the new Russian tariffs, in retaliation for U.S. extra tariffs of 25 percent on steel and of 10 percent on aluminum starting March 23, will amount to 87.6 million dollars a year. The United States also seeks to contain Moscow's energy sector, which the Russian economy heavily depends on. Medvedev on Friday criticized Washington for forcing European countries to buy more U.S. liquefied natural gas (LNG) and complicating the construction of a new Russian gas pipeline to Europe. Russia's Nord Stream 2 will expand the existing Nord Stream main gas pipeline by linking Russia and Germany via the Baltic seabed, bypassing Ukraine, Belarus, Poland and other eastern European and Baltic countries. U.S. President Donald Trump lashed the German government for agreeing on the project last month at the headquarters of the North Atlantic Treaty Organization in Brussels, saying that the pipeline will make Germany dependent on Russia. Peskov said Trump's criticism was aimed at promoting sales of U.S. LNG to Europe and the Kremlin considered this to be a manifestation of unfair competition.